Why pay for laser in a clinic when you can go to a spa? What makes it even more tempting is when the non-clinics you visit, claim that they can offer the same or similar treatments offered by doctors. Laser treatments are often used as a comparison as they are able to rejuvenate skin and remove hair – areas that non-clinics obviously want a big share of. So here’s what we would say if you ask us: Why pay for laser treatments in a clinic when I can go to a spa? Under the Singapore regulations, laser treatments have to be performed by a registered medical doctor who is trained in the procedure. 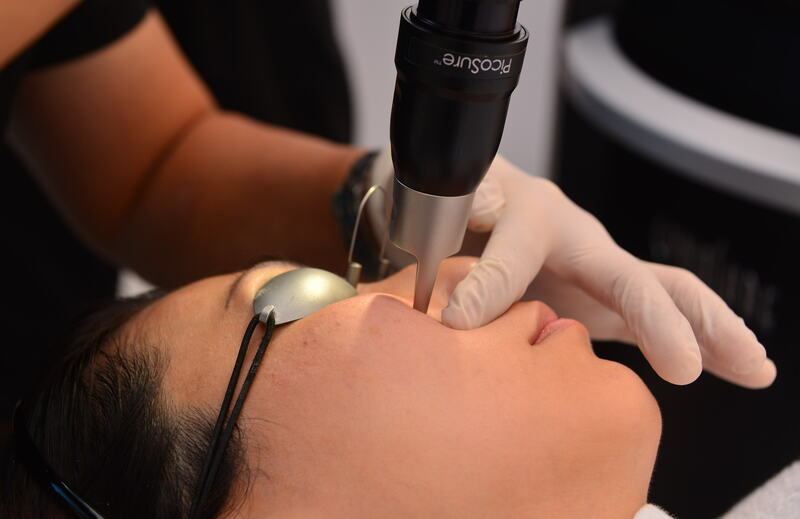 Lasers used in clinics are approved by health authorities and in the case of Singapore approved by the Health Science Authority. Many of these lasers also have approval by the US Food and Drug Administration (US FDA), which has one of the world’s most stringent standards for medical devices. We are talking about laser machines that have gone through multiple tests, scientific evidence of their efficacy and safety. Therefore, with the doctor and clinic-based treatments, you get a peace of mind. How much is confidence and assurance worth? Our guess is that it is worth quite a bit more than what people think. You can get a laser skin toning treatment with a Q-Switched laser at $290 and one with the PicoSure laser at $390. A full-face rejuvenation with PicoSure to tackle pigmentation, wrinkles, pores, and scars costs $590. If you have been scanning the market, you’d know that there are some non-clinics who sell skin rejuvenation treatments at the same price or more. Of course, there are also those who sell them at much less. But you know there is always a catch – the pressure to sign up for a big, hefty package after the initial treatment. Also bear in mind that a trained medical doctor will be treating your face for that same price, not a therapist. Lasers are focused and very powerful beams of light that are tuned to different wavelengths. Each wavelength is used for treating different conditions. This is the reason why there are so many different types of laser machines and each is good for treating different things. So if you have a problem with acne scars, the doctor may prescribe a Fraxel or PicoSure treatment. But if you want to have your spider veins removed, only a Long-Pulsed laser can do the job. If you go to a clinic that owns a wide range of lasers, you would have access to different devices that are medically proven to treat a wide range of problems, from pigmentation removal, skin firming, erasing of fine lines and wrinkles, hair removal, acne and acne scar treatment, tattoo removal to reduction of pore size. This is the part where we tell you how many lasers there are so that you know what you are getting into when you decide to do a laser treatment. Let’s talk about ablative and non-ablative lasers first. Ablative and non-ablative lasers are used for facial rejuvenation. Ablative lasers remove a thin outer layer of skin to achieve the desired result. This reduces the appearance of fine lines, improves skin texture and tightens pores with the growth of fresh, new skin. This also lightens pigmentation and skin blemishes. A non-ablative laser is different in that it targets only the deeper layers or certain structures within the skin to achieve the desired result. The skin while the top-most skin is retained to reduce the downtime. Your doctor will be able to advise you on which is most suitable for your skin condition. You will see the word “fractional” used alongside ablative and non-ablative lasers. That’s because of the technology involved. Laser resurfacing involves removing layers of skin tissue in a “fractionated method”, where columns of skin are removed, leaving the skin surrounding each column intact to aid in healing. The Fraxel Dual laser doesn’t have the word “fractional” in it but it utilises the fractional technology. “Fraxel” is a brand name. The fractional carbon dioxide (CO2) laser takes the CO2 laser beam and fractionates, or breaks that beam into hundreds of tiny little columns of light. These tiny shafts of light penetrate deep into the skin. The skin then repairs those tiny shafts by pushing out the old damaged skin and replacing it with new skin. 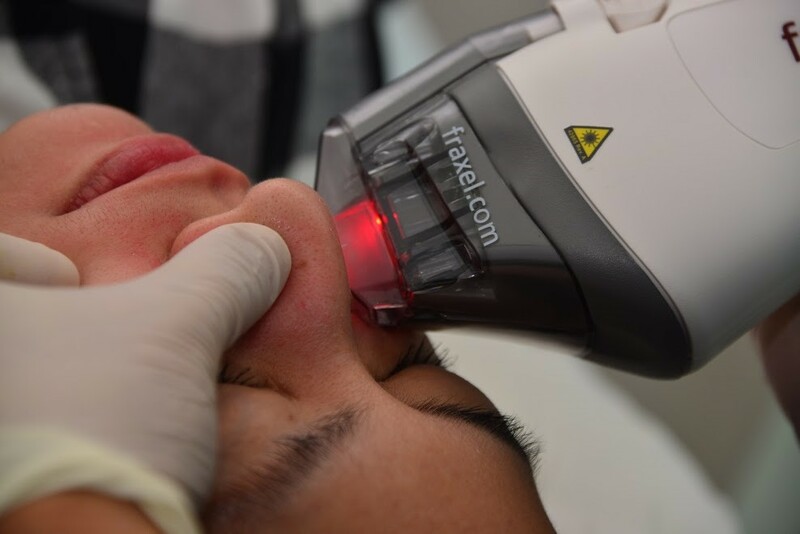 The heat from the laser also helps to stimulate the growth of new collagen, aiding in the development of younger, smoother skin, and reducing the size of acne scars. Sometimes you might see the fractional Erbium laser called the “Er:YAG” laser. The name comes from the laser medium – the Erbium-doped Yttrium Aluminium Garnet – that it uses to produce its light energy. Like the fractional CO2 laser, it removes a very fine layer of the epidermis (top layer of the skin) to reveal skin that is smoother and younger looking. This laser also promotes collagen production to tighten the skin. Q-Switched is a highly versatile laser which uses the Nd:YAG or Neodymium-doped Yttrium Aluminum Garnet crystal rod to produce its light energy. That’s why sometimes doctors call it as the “Q Switched Nd:YAG laser. It produces extremely quick, brief, and intense pulses of energy in nanoseconds or billionths of a second. It is used for skin toning where the laser helps to lighten pigmentations and blemishes from the face so as to achieve a more even, healthy skin tone. It is also used for removing tattoos. Laser energy is delivered using long pulses in the Long Pulsed Nd:YAG laser, which are converted into heat in the tissue. This laser energy is selectively absorbed by the deeper levels of the dermis, which allows doctors to treat deeper vascular lesions like spider veins, hemangiomas (strawberry mark), and leg veins. At the same time, it can treat the skin at a more superficial, subcutaneous level for skin rejuvenation. It is also used for hair removal and treating acne and acne scars. The 1550nm Er:Glass laser penetrates deep into the skin to address wrinkles and acne scars. The 1927nm Thullium laser addresses problems with skin tone, texture, pigmentation, and other more superficial skin growths or signs of ageing. This fractional laser targets damaged skin with microscopic laser columns that penetrate deep into the skin. It treats only a fraction of skin at a time, leaving the surrounding tissues untouched. This means that the recovery time from this non-ablative laser would be shorter compared to traditional ablative lasers. PicoSure is a picosecond laser that delivers ultra-short pulse bursts of energy to the skin in picoseconds (trillionths of a second). It shatters the pigment on the skin into tiny dust-like particles, which are then absorbed by the lymphatic system and eliminated naturally. Unlike traditional laser that uses photo-thermal action, the PicoSure laser is designed to deliver laser energy only to target particles without burning the surrounding tissues. With less production of heat, tissue damage and discomfort are greatly reduced. 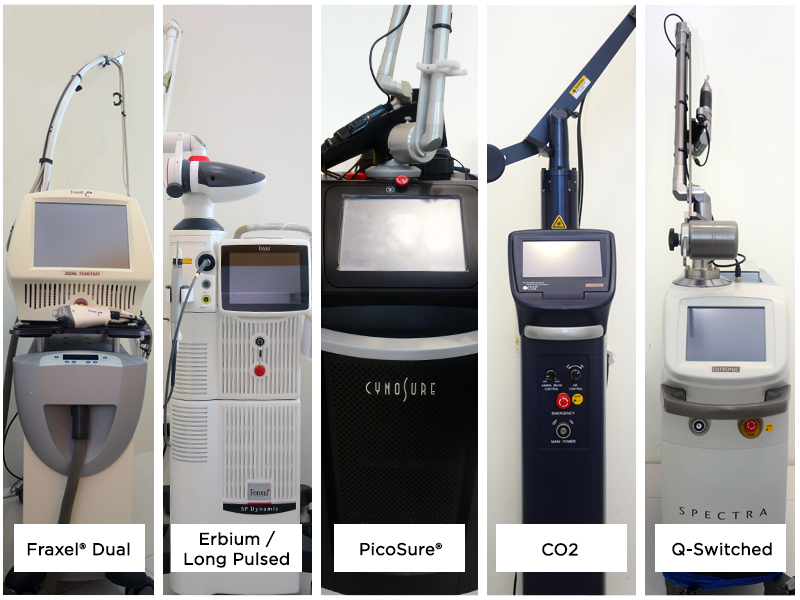 PicoSure’s PressureWaveTM technology uses an unique wavelength of light (755nm) and a specialised lens to convert laser energy into gentle pressure. This pressure squeezes cells, activating the natural cell signalling process that creates new collagen and elastin. This results in brighter, smoother, and younger looking skin with very minimal downtime compared to other similar lasers. The same PressureWave technology is used in the removal of pigmentation, acne scar, and ink particles in tattoos without harming the surrounding tissue. Smoothens wrinkles and fine lines.